Your wedding photos are going to be around for a very long time. You and your parents are sure to want to frame them, there’ll be the album to flick through at every opportunity, and your children and grandchildren will pour over them in fascination. So basically you want to look fabulous! 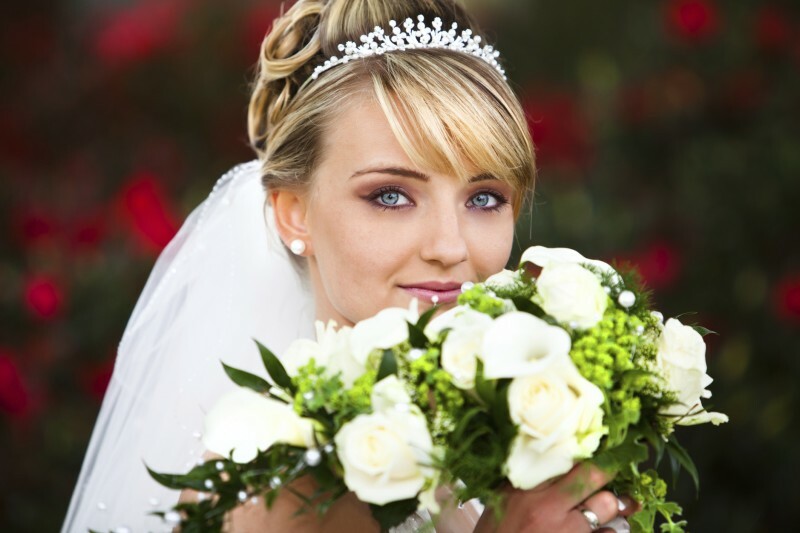 Read our top tips for looking great in your wedding photos. Smiling continually can make your jaw hurt, and your grin can begin to look fake after a while. You don’t want to look sullen in your wedding photos, however, so a great tip is to push your tongue against the back of your front teeth to keep that smile looking natural and genuine. Make sure a double chin doesn’t spoil your photos by holding your head high when you’re being photographed. As well as stretching out a double chin this will also give your jaw definition and make you look more self-assured. If keeping your chin up gives you a sore neck, try leaning forward a bit instead to achieve the same impression. Put some thought into the colour of your dress. When you go dress shopping ask your maid of honour to take photos of you in a various shades of white, creams, and ivories, and consider the results carefully before you make your final choice. You may have dreamed of that pure white wedding gown but some skin tones look just awful next to white. Fiddling with your dress or hair can ruin your pictures and make you look anxious so think about the position of your hands. Try to keep them hanging casually by your sides, alternatively hold a clutch bag that matches you dress or firmly grasp that bouquet! Every bride is a unique shape and certain poses will emphasise your best features. Try standing with one foot in front of the other or turning your body a little to the side and just turning your head and shoulders towards the photographer. You may feel foolish trying out various poses for your wedding photos in front of the bathroom mirror, but a bit of practise will pay dividends on the day. Try not to use heavy fake tan which tends to look unattractive in photographs and can come out more orange than it looks in natural daylight. Choose a foundation with yellow tones to balance out your skin tone as pink and red tones are picked up by the camera. Make sure your photographer takes some casual shots of you mingling with your friends and family; often the natural pictures of you laughing and enjoying yourself turn out the best. Some people just don’t feel at ease posing for formal photographs, and no matter how hard you try you can end up looking contrived and uncomfortable. Embellishments such as beads on a veil can look like spots on a photograph. Ask someone to take a photo of you in your veil beforehand and if you are not happy with the results make sure you pull the veil back for the vital shots.